Cast On, Bind Off eBook (the Inkling version) was reviewed and loved by Knitty in their winter 2013 issue. This is the best knitting ebook from a print book that I’ve used. Granted, I have only seen and used one of their titles, bit Inkling seems to get ebooks for crafters better than most. The interface is intuitive and easy to use, even though I am not much of a tech person and frequently get lost in ebooks. There is the ability to jump around, which I love. 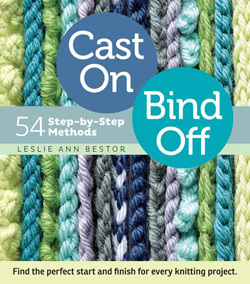 All of the cast ons and bind offs are hot linked for step by step directions or you can jump to a slide show. You can add bookmarks and notes with in the book, that are searchable. There are pop up definitions throughout the book. Visually this book is incredible. Some ebooks look photocopied – this is crisp and clear even when I zoomed in really, really closely to see just exactly what the needle is doing in a bind off. I used this book on both my iPad and iPhone it worked equally well on both. I hope this is what the face of craft ebook publishing looks like. Inkling also has a few more craft ebooks by Storey Publishing available — check ’em out!